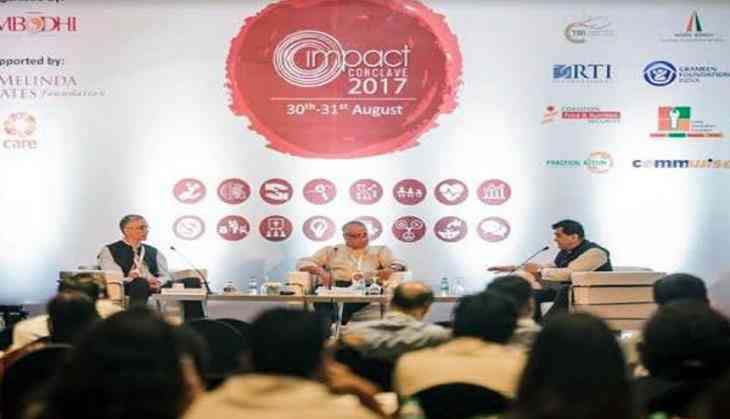 The Impact Conclave, an international conference on sustainability organized by Sambodhi Research, was kick-started with plenary session by Amitabh Kant, CEO NITI Aayog and Parameswaran Iyer, Secretary, Ministry of Drinking Water and Sanitation. Kant said how creating sense of competition among states for doing business in India is working well and a parallel may be drawn on sanitation, to which Iyer agreed. Kant talked about outcome based monitoring of programs and emphasized the use of technology in program implementation. Kant said that major shift could be to see the 'delta' i.e. the change in performance over last year and how programs and implementing officers should be evaluated on the same. Iyer said that while the infrastructure is being put in place and awareness programs are being run, it's the ground level personnel who can bring behavioral change. There is work going on to put and train personnel at village level. He also said under the leadership of Prime Minister Narendra Modi, the near-unanimous support of political leaders across states, civil servants and most importantly, the leadership of grassroots-level leaders like sarpanches, especially the women, there is now a quiet confidence across the country that the Jan Andolan will succeed. "Given the current global environment, it is more important than ever for likeminded individuals, organizations and Governments to address the issues in sustainable development landscape. For the world to achieve SDGs, India has to play a very significant role both locally and globally. For doing this, India needs concerted efforts. This platform is created to enable an ecosystem for that concerted action," said Kultar Singh, Chief Executive of Sambodhi Research and Communications. The two-day conclave addressed issues ranging from discourse and advocacy, existing implementation models, emerging measurement mechanisms to methods for scaling up interventions. Focusing on the current national sustainability agenda, the conference probed the progress of key initiatives in the areas of Skill India and Make in India, Swachh Bharat, Digital India and identified existing and future thrust areas for social transformation. Through various panel discussions, the conference explored ideas for big impact in addressing poverty through inclusive finance, evidence-based approach to public health policy, innovations by start-ups and social enterprises, transforming villages by addressing rural-urban divide, clean energy interventions, quality education for all, eradicating malnutrition, the role of big data in research, measuring impact and human progress, role of civil society and inclusiveness through innovation. The conference, now in its second year, brought together civil society organizations, multi and bi-lateral agencies, federal bodies, media and academia to debate the most contemporary and cross-sectoral developmental issues. The event also celebrated the contribution of professionals in areas of programme implementation, innovation, use of technology, income generation and skill enhancement, with the Impact Awards 2017 held on day-two of the conference. Among the recipients were individuals working in the domain of Public Health, Livelihood, Inclusive Finance, Skill Development, Nutrition, WASH, Advocacy and Communications and Environmental Sustainability. The event also supported aspiring social entrepreneurs from the student community with the Runway Awards. Winners included undergrad and b-school students, corporate professionals and independent consultants who received a financial reward to support their initiatives in the sector.